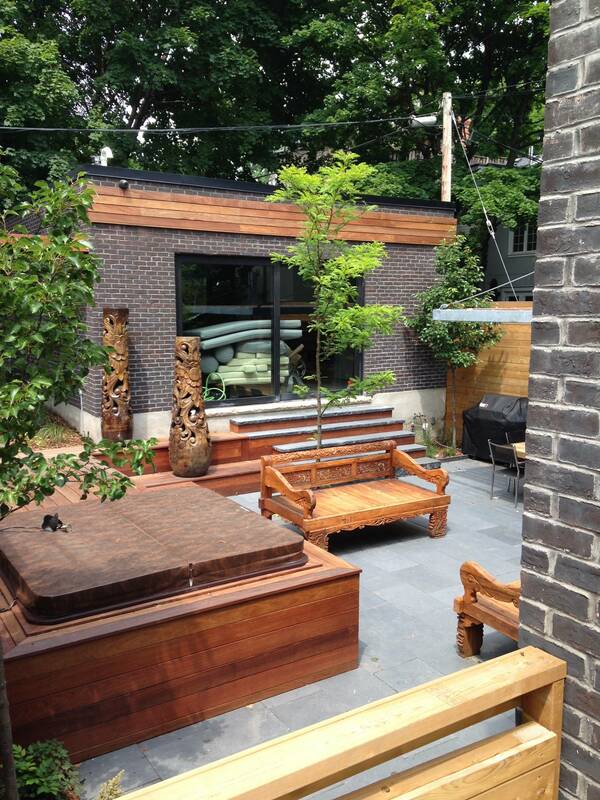 Homeowners are looking for architectural elements to make the garage part of the outdoor space, such as this Cabbagetown backyard. When Roni Brown and her husband bought an Upper Beach home in 2013, they suspected the garage behind the house needed plenty of work, and their instincts proved to be well founded last year as they set to work restoring the space. The studs were so rotten, recalls Ms. Brown, an interior decorator, that when their contractor removed the walls, the garage actually swayed. "It was nasty." The couple spent $15,000 firming up the foundation, roof and walls, and cleaning some of the original wood panels. Now, a workbench takes up half the space and the rest is decorated with quirky furniture and shelving, and serves as an outdoor room. As Ms. Brown points out, the garage takes up most of their backyard, so it has become an extension of their living space. "We just felt garages are so valuable in the city that you've got to take care of them." Welcome to Toronto's garage rebuilding boom. According to city building permit data, homeowners have spent almost $30-million on more than 2,400 garage projects since 2014, and those numbers don't include all the projects completed without a building permit. While a significant proportion seem to be situated on the extensive network of downtown laneways, contractors and architects also say the vast majority aren't laneway housing, although those kinds of conversion projects get the lion's share of attention from policy-makers, architects and the media. "It's exploding," says contractor Joël Campbell, whose firm, Laneway Custom Builders, has been exclusively rebuilding garages for the past three years. General contractor Dave Youngs, who fields almost a dozen garage reno inquiries a week, adds that few want some kind of dwelling unit. "It's nothing like the tear-downs and new garages, which support a lot of contractors and carpenters." Developer Andrew Sorbara, who cofounded the Lanescape Project, which has pushed the city to approve rental laneway suites, says he doesn't think the surge of garage rebuilds will eat into the supply of potential laneway housing locations. The city's planning staff is currently studying Lanescape's proposal. In the meantime, Mr. Sorbara says that he tells people who contact him about garage reno projects to build solid foundations so that a carport can be repurposed later on. In older but rapidly gentrifying areas, a laneway garage adds plenty of value to a property, but many are very old, rickety and likely used mainly for storing junk. It's not uncommon to see laneway garages with precariously sagging roofs and overgrown doors that clearly haven't been opened in decades. But with affluent, new owners paying top-dollar for downtown homes, garages are sometimes knocked down to allow construction equipment to gain access to the rear of the house, then rebuilt as part of an overall renovation project. For more established residents who can't afford to move, a renovated garage adds more living and storage space, says Mr. Campbell. The costs can vary dramatically. Mr. Youngs says a basic slab foundation plus a prefab concrete block garage will cost about $35,000, with further features – insulation, plumbing, heating, decor, etc., – adding further expense. Some homeowners are looking for additional architectural elements on both exteriors and interiors, especially for garages that will be repurposed as outdoor rooms, cabanas, yoga or art studios, workshops, and so on. Mr. Campbell says a growing number also want their renovated garages to be equipped with high voltage electrical outlets suitable for charging electric vehicles. Mr. Youngs points out that while homeowners may describe the project as a garage reno on the building permit application, the actual end use is for some other purpose. Certain building code restrictions come into play with more elaborate versions – if there's a room above the garage, the structure needs specialized ventilation. Exterior and interior aesthetics, such as French doors opening into the backyard, are also important. Ms. Brown clad her refurbished garage doors with translucent panels and black edging to achieve a modern, clean-lined look. Mr. Campbell had a client who had a climbing wall and an ax-throwing target installed in their garage. Adding a vinyl wrap to a garage can make graffiti easier to clean or remove. Nicholas Discenza, an architectural designer at Sustainable.TO, says he has worked with clients who have expressed concerns about recurring graffiti and tagging. The solution: vinyl wrap murals for garage doors that have complex designs and are easy to clean or remove. They add $1,000 to $1,500 to the budget. According to Mr. Discenza, some clients are also asking for green roofs for their garages as an alternative to standard tiles. Prices for such roofs are highly variable – anywhere from $2,000 to $10,000 for a 200 square foot roof – depending on the depth of the growing strata that sits on top of the waterproof membrane. Some suppliers offer annual maintenance packages, but he cautions that these tend to be expensive, especially for small projects like garages. One west-end homeowner with a south-facing garage went one large step further, reinforcing the foundation and then over-building the roof so it will hold a full vegetable garden and a small patio with space for a couple of Muskoka chairs. Some owners use the roof of their garage as a garden. "The weight of the soil is considerable," says the owner, who asked that her name not be used because the project was completed without a building permit. She explains that there's a micro-climate on top of the roof that has greatly accelerated the growing season for her eggplants, green peppers and other vegetables. "I've got tomatoes up the whazoo." As with others interviewed for this story, the space transcends the traditional vehicle/storage functions of rear garages, and becomes part of the backyard and living space on an otherwise cramped lot. "We call it the cottage," she says. "Go out back and climb up the ladder." Adds Ms. Brown: "If you have a garage, that means a lot and not just for resale. It's worth the investment."